salamandir (three "a"s, an "i" and no capital letters) was born in Peoria, Illinois, and as a result, he played Peoria at a very early age. He has had an interesting mix of stodgy, pedantic, classical musical training, and intensive, intuitive, unstructured self-teaching. He has always been addicted to odd (some would vehemently insist "annoying") noises, and has learned through the years that it is possible to get an interesting sound out of practically everything. Before he ever even saw or heard one, he taught himself to play the didjeridu, including the circular-breathing technique, much to the chagrin of his trombone teacher who couldn't do it. He began studying trombone at age 10, and by age 15 he was studying with H. Dennis Smith, the principal trombonist from the Los Angeles Symphony. 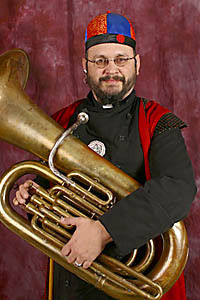 He has taught himself to play tuba, trumpet, french horn, baritone horn, mellophone, clarinet, saxophone, bassoon, basset horn, flute, guitar and keyboards. He is also a professionally trained musical instrument repair technician, and sound engineer, not to mention a professional computer geek, graphic artist and typesetter. Over the years, salamandir has played a bewildering variety of brass, woodwind and keyboard instruments (some at the same time) in symphony orchestras, theatre orchestras, marching bands, community orchestras, recording studios, rehearsal bands, pick-up groups and on the street. His primary musical influences are Frank Zappa, Morton Subotnik, Philip Glass, The Holy Modal Rounders, Popeye, Donald Duck, various roots and herbs, and everything else.